A lot is known about the hunger-holocaust in the Ukraine which was triggered by Stalin in the early thirties, to which about 7 million people fell victim. It is much less known that Britain enforced a similar policy in Ireland, followed for centuries in order to break the will to independence of the Irish. Almost completely unknown are the consequences which the British occupation policy had on the nutritional situation in India. Although the Indian subcontinent had always suffered from relatively severe famines, they were never as devastating as under the British occupation. "During colonial times, India suffered more frequently, more severely, and at larger extents under famines than at pre-colonial times. [...] It is important to note that hunger and death occurred even when there was a uniform administrative structure and a far superior traffic system than at the time of pre-British India under the moguls. In addition to usual climatic factors it turns out that the bad situation got even worse as a result of price manipulations by food merchants, inactivity of the government as well as export of food even at times of shortages, accompanied by a gradual deterioration of the income as well as the employment situations of the agricultural workers and small farmers." The most appalling hunger catastrophes of all took place in Bengal, the grain center of India at that time, in 1770, when approximately one third of the total population died because of a drought--10 million people! The British East India Company, which had occupied the country five years earlier, was completely unprepared for this situation. But it did not even once attempt to introduce any measures of aid worth mentioning. The responsible British colonialists evidently were interested only in maximizing their profit through trading and the export of food, which, even though it not causing the famine, certainly made it drastically worse. 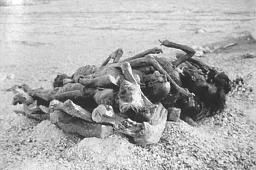 Until the dissolution of the British colony in the year 1947, some thirty more famines occurred, some sources even mentioning about 40, depending on how a famine is defined. Consequently, India's former corn center Bengal was transformed to the poorhouse of Asia within only two centuries. There are many reasons for this catastrophic colonial policy during these 182 years, to which countless more millions of Indians fell victim than would have died under normal circumstances. In the beginning was the dismantling of the traditional Indian social system, in which the respective local rulers and landowners (in Hindu zamindāri) took care of their subjects in times of need for protection and the supply of food rations necessary for survival. The British replaced this paternal social system with something that was decried later as Manchester capitalism: landowners had to pay a fixed tax to the colonial power. The questions of rent and lease income were left to the 'free market'. Delinquent taxpayers were simply disowned; leasers and renters who did not meet their obligations were evicted. In many cases, the paternal zamindār were transformed to greedy capitalists. The consequence was the destruction of the living foundations of many small farmers and agricultural workers. The rich became richer and more ruthless, the poor poorer and more helpless. According to the ideology of Manchester capitalism, any interventions by the authorities into the economy were generally avoided. Despite frequent famines, effective interventions in the market did not occur, for example through price control, subsidies, social relief measures, or government financed or supported food purchases and transports. Bengal (Eastern India, today's Bangladesh) was one of the earliest colonial districts conquered by Great Britain in India. Accordingly it still has to suffer most under the consequences. The situation worsened, especially since the turn from the 19th to the 20th century, caused by accelerated population growth, which led to an increased number of penniless farmers, as well as by the rise of lease rents to up to 50% of the value of the harvest. The last big famine in Bengal under British occupation occurred between 1942 and 1945 (Brahmaputra-Ganges-Delta, today partly India, partly Bangladesh). Besides the unfavorable social conditions already described, other factors were added which in the end triggered the catastrophe. The Indian Amartya Sen, who received the Nobel Prize for Economic Science in 1998, took the eccentric view that this famine was man made because there was essentially no food shortage, which earned him strong opposition, to put it mildly. The discussion resulting from Sen's warped theory strengthened the theory that food shortages are the primary cause of famines. Since 1940, all proposed constitutional reforms were deferred in order to place India fully into the service of the war efforts against Germany. Consequently, the Congress Party, India's largest national party (the one of M. Ghandi) withdrew its cooperation with the government which led to considerable internal political tensions. Due to the socially strained situation, violent conflicts arose repeatedly between the colonial authorities and independence fighters. Because the Gulf of Bengal was viewed as a possible location for a Japanese invasion, a strong independence movement there was unacceptable to the British, who therefore executed a military police action in October 1942, during which 193 camps and buildings of the Congress Party were destroyed and countless people arrested. Between August 1942 and February 1943, 43 persons were shot by the British occupation police. Additionally, British troops were involved in an unknown number of rapes and lootings of food supplies, among other things. In May 1942, the British colony of Burma, which until then had exported food to India, fell into Japanese hands. In the Summer 1941, Great Britain lost control over the Gulf of Bengal for about one year, which led to the collapse of all civilian sea traffic. Export of Bengal's principal export product, jute, via the sea route became impossible as well as importing food. Bengal was overcrowded with refugees as well as with retreating soldiers from various British colonies which were temporarily occupied by the Japanese. In March 1942 alone, around 2,000 to 3,000 British soldiers and civilians arrived in Calcutta and Chittagong every day, and in the month of May, a total of 300,000 were counted. Because these people could not all be accommodated in the cities, preliminary camps were erected for them in the countryside before they could be transported to the interior. In the meantime, thousands of them died of malaria and cholera. As a result of the massive food purchases by the government, food prices in the countryside skyrocketed. Expecting a Japanese landing in the Gulf of Bengal, the British occupation authorities enacted the so-called "Boat-Denial Scheme" leading to the confiscation of all boats and ships in the Gulf of Bengal which could carry more than 10 persons. This resulted in not less than 66,500 confiscated boats. Consequently, the inland navigation system collapsed completely. Fishing became practically impossible, and many rice and jute farmers could not ship their goods anymore. Subsequently the economy collapsed completely, especially in the lower Ganges-Delta. The confiscations of land in connection with military fortifications and constructions (airplane landing places, military and refugee camps) led to the expulsion of about 150,000 to 180,000 people from their land, turning them practically into homeless persons. Food deliveries from other parts of the country to Bengal were refused by the government, on the one hand in order to weaken the independence movement, on the other hand in order to make food artificially scarce. This was an especially cruel policy introduced in 1942 under the title "Rice Denial Scheme." The purpose of it was to deny an efficient food supply to the Japanese after a possible invasion. Within this policy, the government authorized free merchants to purchase rice at any price and to sell it to the government for delivery into governmental food storage. in Bengal during their Cremation. This blank check of the government triggered price inflation. As a result, some merchants did not deliver food to the government but hoarded it, hoping for higher profit margins when selling it later. This led to further food shortages on the market and to further price increases. For military considerations, the government emphasized that the food supply for soldiers, government employees, and workers within the defense industry had to be maintained under all circumstances. In addition to this inflationary thrust, the massive military activities in Bengal that were basically financed by overtime of the money printing presses led to a general inflation which hit the impoverished population in the countryside especially hard. On October 16, 1942, a hurricane caused a five meter high wave to flood the entire lower Ganges delta. It destroyed the winter harvest, salted a gigantic area of land, killed about 14,500 people and 10% of the cattle. Wood for the cremation of the bodies was not available, and decaying corpses caused the contamination of drinking water and finally the outbreak of cholera and other infectious diseases. In connection with the aid measures introduced after the flood in the fall/winter of 1942/1943, the government returned only one third of the food that had been previously withdrawn from Bengal. Further food supplies from other parts of India were purchased only during the following spring when the famine in Bengal was in full swing. This again led to a general increase in food prices. The Government never thought about a legally enforced price control of basic food s upplies. Because the military transports had absolute priority, the Indian transport system was not able to bring greater quantities of food to Bengal. 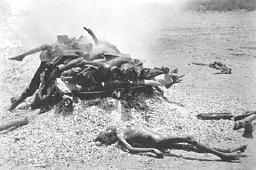 Even though British law in India provided that emergency laws were to be applied in case of famines, the famine in Bengal was never officially recognized as such, an emergency was not declared, and therefore no drastic counter measures were taken for its amelioration. It was not until October of 1943 that the British government took notice of the emergency situation, but it still refused to introduce any supportive measures that would have been necessary. British Manchester-Capitalism destroyed the traditional social support systems and caused the impoverishment of broad sections of the population. Suppression of the Indian independence movement and the lack of will of the British to help the suffering Indian rebels. Unwillingness and incompetence of the colonial masters to acknowledge the famine catastrophe and to introduce proper counter measures, especially food imports. "[...] It seems that the British colonial civil servants in India brought on a similar famine, as they did in Ireland a century earlier.[...]" Moreover, an extraordinary characteristic of this horrible list of genocides and worldwide mass murders, triggered by British imperialism (through war, epidemics, and famines), is the total absence of any public awareness in Britain. The analysis of writings about British history shows for example, that the Irish famine of the years 1845-1847 is covered by a few lines at most. And it can hardly surprise that the famine in Bengal is not mentioned at all, Mullin points out. 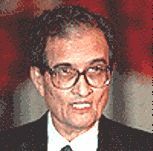 Prof. Dr. Amartya Sen, Nobel Prize winner for Economical Sciences 1998, dedicated most of his work to the fight against hunger in the Third World. His contribution to our understanding of famine is highly controversial, as it suggests measures which are highly counterproductive. Hence, his work is little appreciated in India. Even though India imported about 1.8 million tons of cereals before the war, Britain made sure that India had an export surplus of rice at record levels in the tax year 1942/43. "The bad situation in Bengal was discussed in the British Parliament during a meeting at which only 10% of all members participated. Repeated requests for food imports to India (400 Million people) lead to the delivery of approximately half a million tons of cereal in the years 1943 and 1944. In contrast to this was the net import to Great Britain (50 Million people) of 10 million tons in the second half of the year 1943 alone." Churchill repeatedly denied all food exports to India, in spite of the fact that about 2.4 million Indians served in British units during the Second World War. The Nobel Prize winner Amartya Sen lived through the famine in Bengal as a nine year old boy. He reported how incredibly many starving, dying people appeared suddenly from nowhere. According to Prof. Sens point of view, it is always autocratic systems which are affected by starvation catastrophes, never democracies, because they have to pay more attention to the basic needs of the people. Considering, however, that democracy hasn't prevented India, Bangladesh and other third world countries from suffering severe famines, Sen's view certainly is too simplistic. In colonial India and Ireland, the British ruled autocratically. They had absolute power, which often corrupts absolutely, as is well known. But corrupt governments have little interest in halting a famine, whatever the reason for its occurrence. In Ireland as well as in India, food could have been made available, if not by redistribution, then by massive imports or a change from repressive policies, but there was no moral incentive to such changes. All in all, British colonial policy was aimed at exploiting its colonies as far as the people living in them would allow without major rebellion. During recent years, the young German historian Christian Gerlach has become known for his examination of the food policy of the Third Reich during the Second World War. In two monographs he claimed that the Third Reich, based on experiences gained during the First World War, did everything to ensure that the German population would not suffer from hunger during the war. To this purpose, the food resources of occupied territories were used to cover German needs, by conscious neglect of the nutritional needs of the local population. According to Gerlach, this was especially true for eastern territories which were under temporary German occupation during the Russian campaign. Consequently, Gerlach's two books addressing this topic, which were published by the communist publisher Jan Philipp Reemtsma, have telling titles: Krieg, Ernährung, Völkermord (War, nutrition and genocide) and Kalkulierte Morde: Die Deutsche Wirtschafts- und Vernichtungspolitik in Weißrußland 1941 bis 1944 (Calculated Murders: The German Economical and Extermination Policy in White Russia 1941 to 1944). Gerlach is certainly correct in so far as the government of the Reich placed a higher priority on the nutrition of the fighting troops and its own people than on the nourishment of essentially non-participating population groups in occupied areas. In this respect the policy of Great Britain resembles that of Germany at this time, both forced by purely war related issues. There is, however, a fine difference: whilst the nutritional situation in the German occupied zones of the Soviet Union was disastrous in some areas not due to German measures, but because of Stalin's policy of 'scorched earth' during the Soviet retreat--a fact to which Gerlach hardly gives his attention--the corresponding scarcity and inflation in India was essentially the consequence of British policy. Unfortunately it also has to be stated here that, as always, actual or alleged German atrocities receive one-sided and often distorted attention in the public mind, whereas balanced descriptions and comparative studies of similar events which occurred elsewhere in the world are generally avoided. That could put in doubt the alleged uniqueness of the German 'evilness', and this is, as is generally known, politically incorrect and thus undesirable. First published in German in Vierteljahreshefte für freie Geschichtsforschung 3(3) (1999), pp. 274-278. Translated by Fabian Eschen. Mohiuddin Alamgir, Bangladesh, Bangladesh Institute of Development Studies, Dacca 1978, pp. 48ff. Mohiuddin Alamgir, Famine in South Asia, Oleschlager, Gunn & Han, Cambridge 1980, p. 59; retranslated from German. C. Walford, "The Gamines of the World: Past and Present", in: Journal of the Statistical Society, 41(3) (1978), pp. 436-442. A. Loveday, The History and Economics of Indian Famines, Bell & Sons, London 1914, pp. 135ff. Cf. for this Paul R. Greenough, Prosperity and Misery in Modern Bengal, Oxford University Press, New York/Oxford 1982, pp. 42-61. Regarding the disastrous effects of applying the pure theory of the free market in India cf. S. Ambirajan, Classical Political Economy and British Policy in India, Cambridge University Press, Cambridge 1978, regarding various famines especially pp. 59-100. Cf. Paul R. Greenough, op. cit. (note 5), pp. 61-70. Amartya Sen, Poverty and Famines, Oxford Univ. Press, New York/Oxford 1981, re. Bengalen cf. pp. 52-85. Cf. Peter Bowbrick, How Sen's Theory Can Cause Famines, Quality Economics, Nottingham 1997; P. Bowbrick, A refutation of Professor Sen's theory of famines. Institute of Agricultural Economics, Oxford. 1986. For this, see the Letter to the Editor by Peter Bowbrick, "Tatsachen, Theorie und der Nobelpreis," Vierteljahreshefte für freie Geschichtsforschung 4(3&4) (2000), S. 449-452; Engl. : "Fact, theory and the Nobel Prize," online: www.vho.org/VffG/1999/3/Bowbrick.html. Best summarized by Paul R. Greenough, op. cit. (note 5), pp. 86-138, with more references there. Cf. for this Sugata Bos, "Starvation amidst Plenty: The Making of Famine in Bengal, Honan and Tonkin, 1942-1945", in: Modern Asia Studies 24(4) (1990), pp. 699-727, here pp. 715ff. O. Goswami, O., "The Bengal Famine of 1943: Re-examining the Data" The Indian Economic and Social History Review, Vol. 27, No. 4, 1990. "British greed, grain exports and callous indifference. The 1943 famine in Bengal, India", The Irish People (NY), Nov. 14, 1998, all following quotes from this. The quotes had to be retranslated since this newspaper's online access was recently restricted to subscribers, see http://www.inac.org/irishpeople. Hamburger Edition, Hamburg 1998 and 1999. Source: The Revisionist 1(1) (2003), pp. 71-75.